I nearly always have a cabbage in the fridge, we love it's sweet crunch, it lasts for nearly two weeks, and it can be prepared in minutes. For this one I shredded the raw cabbage with sliced cucumbers, mint, scallions and topped it with extra virgin olive oil, kosher salt, and a splash of white balsamic vinegar. However in most cases I keep it simple with just the cabbage, olive oil, and salt. I know it doesn't sound like much but give it a try, it's incredibly satifying. And it goes with just about anything you're cooking. Last night I served it with pasta with white clam sauce. p.s. It goes without saying that the better your olive oil the better your salad. If you're going to splurge on anything in your kitchen make it the extra virgin olive oil. 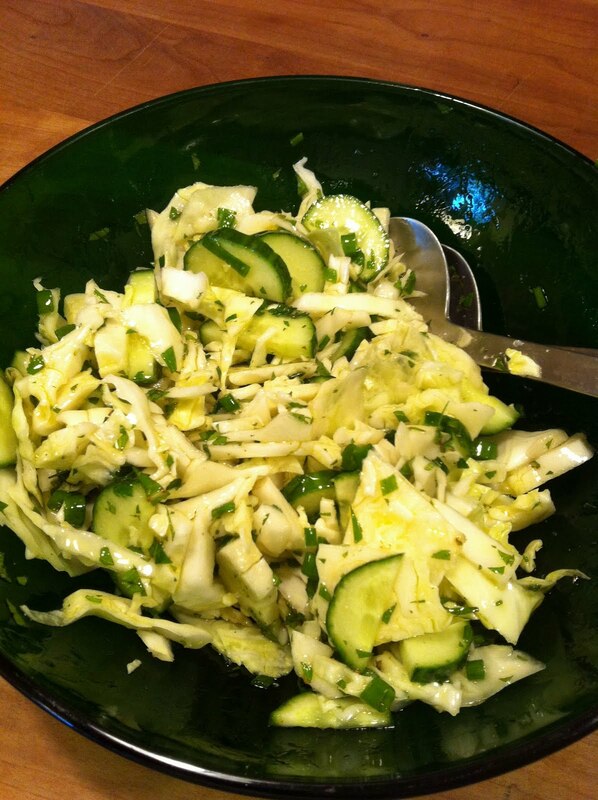 This cabbage salad was a hit at the solstice party I went to this week. The mint was a good addition. Thanks Dave! Yes, the solution to your hopes is presented here see this. An all-black costume on white-colored. Read and focus carefully and you'll get the best dissertation paper. Best of luck!